An Interview with Author Susan Srikant! Today, I'll be interviewing Middle Grade author Susan Srikant! Susan has written three adventure stories so far, but she doesn't just write novels; she also writes plays based on fairy tales for kids to perform! You can connect with her on Facebook and Goodreads. I live in Illinois in the USA in a town where there is a university and a lot of corn fields and some cows. I enjoy playing all kinds of sports, especially volleyball and basketball. I love to hear from my readers! I have written several middle grade books. 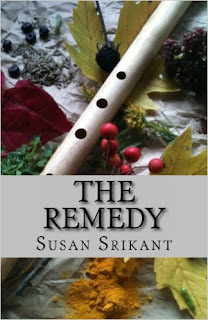 I wrote "The Remedy" about a girl who has an adventure in a mystical forest. I also wrote "The Secret Room of Kaatu Temple" about two sisters who visit relatives in India and have to outsmart a thief. I also wrote several plays for kids to perform as part of the ShowBiz Series. My books are for ages 7 and up. My characters are usually made up from different traits of people I meet. Sometimes I think about the characteristics that I want my characters to have and then they just take on a life of their own! When I was a teenager, I used to like to write songs. It wasn't until much later that I started writing books. I usually write at my dining room table. I like "Gone With the Wind" and Joan Lowery Nixon mysteries. I also like Cornelia Funke's books. Just keep writing. Work on something for a while and then leave it and come back to it later with a fresh view. Have fun with your story! Thanks for chatting with me today, Susan!